A thermowell is a protective housing for a thermometer used to provide temperature readings for an industrial process. Given that process media in many industries are corrosive, abrasive or under high pressure, a thermometer is placed inside a thermowell so the sensitive instrument is not damaged when it is inserted into the process media. This means, however, that the entire thermowell is often exposed to high temperatures and high flow pressures when installed in a pipeline to provide temperature data, and this can lead to a number of issues. One major concern with thermowells is the production of vortices in the media immediately behind the thermowell stem in a fast-flowing process pipe. Under rapid-flow conditions, a “Kármán vortex street” can form, where vortices with opposite directions of rotation create significant vibration and stress the entire instrument assembly. A number of solutions have been implemented to mitigate the impact of vortex-induced vibrations on thermowells and temperature measurement, but all have notable drawbacks (major retrofitting costs, slower thermometer response time, etc.). Realizing that the damping of vibrational excitation using helical strakes is the state of the art in a range of industrial applications today, WIKA’s engineering team designed the ScrutonWell thermowell with external helical strakes that break up the flow across the thermowell, with the result that fewer and smaller vortices are formed even in very high pressure process flows. According to a 2011 study, discussed in the ScrutonWell thermowell data sheet, a helical strake design reduces the amplitude of oscillation (vibration) impacting a thermowell by over 90%. The ScrutonWell solution is also an easy and cost-effective installation that does not require machining of the collar or nozzle, as would be required if you tried to solve the vibration problem by refitting the thermowell with a support collar. The effectiveness of the ScrutonWell helical strake design for thermowells has also been verified by the world-famous independent testing lab at TU Freiburg in Germany. The ScrutonWell solution reduces the amplitude of oscillation by at least 90% in comparison to conventional thermowell stem designs, virtually eliminating vibration stress on the instrument assembly. ScrutonWells can be quickly and easily installed and do not require expensive and time-consuming refitting operations. This innovative thermowell technology is specifically designed for higher flow rates in pipelines with small nozzle connections. The response time of the thermometer is not reduced, as is commonly seen when you increase the root and tip diameter of the thermowell to inhibit vibration. 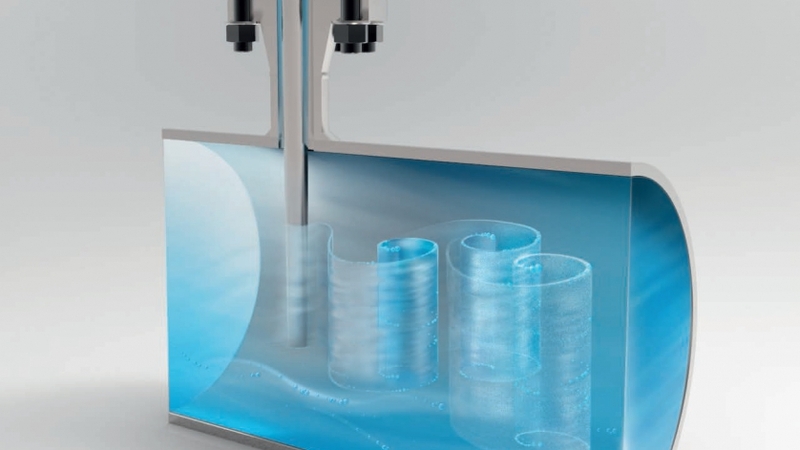 The WIKA ScrutonWell also offers easy, one-step installation much like a conventional thermowell. Find out more about how ScrutonWell technology can help you minimize problems with thermowell vibration and avoid slow temperature reading response times. The knowledgeable WIKA Technical Support Team will be happy to provide you with additional details on this product or answer any questions you may have.